Nearly every country or region has an area on its periphery that regularly attracts a tantalizing assortment of vagrants or a set of species that just barely make it over an international border. Understandably, these sites are particularly attractive and important to birders working on a regional list. For others, it is the desire to have a different birding experience from home without needing a passport. In the ABA region, southeast Arizona and the lower Rio Grande Valley of Texas host many sites right along the Mexican border that fit this description. Every year, birders in both of these states find species more typical of Mexico (and sometimes within plain sight of Mexico!) while also adding a wide assortment of specialties to their ABA lists such as Northern Beardless-Tyrannulet, Gray Hawk, and Green Kingfisher. Thailand also has a site where birders go for very much the same reason that Americans go to Bentsen-Rio Grande State Park or the Chiricahuas. It is called Doi Lang, a mountain with a winding road that flanks the Burmese border in far northern Thailand that has affinities to the Himalayan foothills further north and west. Andy Walker and I had the pleasure of visiting Doi Lang in late December of 2013 right on my birthday — so many birthday birds on that day! 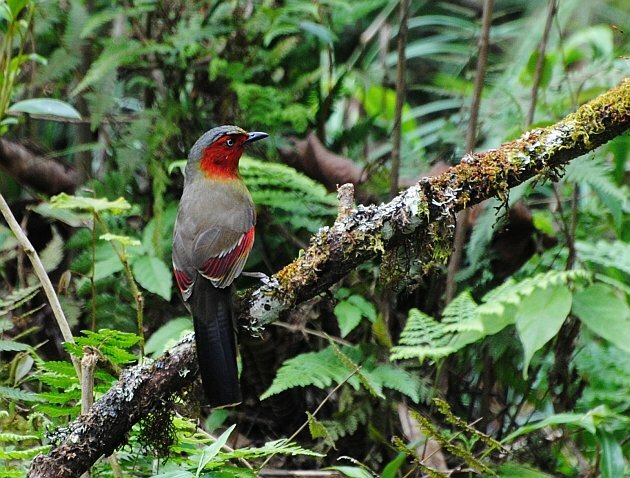 Doi Lang is the most reliable site in Thailand to see the stunning Scarlet-faced Liocichla. Doi Lang hosts a number of beautiful and charismatic species that barely spill over the Burmese border. As soon as we got out of the car at our first stop, a White-tailed Robin popped out of the bushes and followed us for about thirty minutes — a life bird for both of us. There is no shortage of bulbuls here, a family well represented in the Oriental region but familiar to birders in the Western Hemisphere only as the introduced Red-whiskered Bulbul. Species like Crested Finchbill, Brown-breasted Bulbul, and Striated Bulbul can be found along woodland borders and secondary growth in good numbers. Small clearings with feeding stations set up by photographers are neatly tucked away along the length of the road, bringing in more secretive species such as the bizarre Rusty-cheeked Scimitar-Babbler, beautifully colored Scarlet-faced Liocichla, and the sharp White-browed Laughingthrush (the field guide depicts a drab bird). 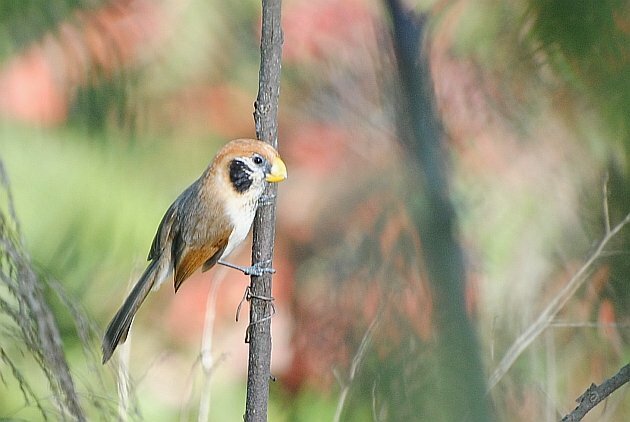 Grassy agricultural areas have a completely different set of species, including Burmese Shrike and Crested Bunting. These are only some of a long list of mouthwatering expected species that we did not encounter anywhere else on our trip. 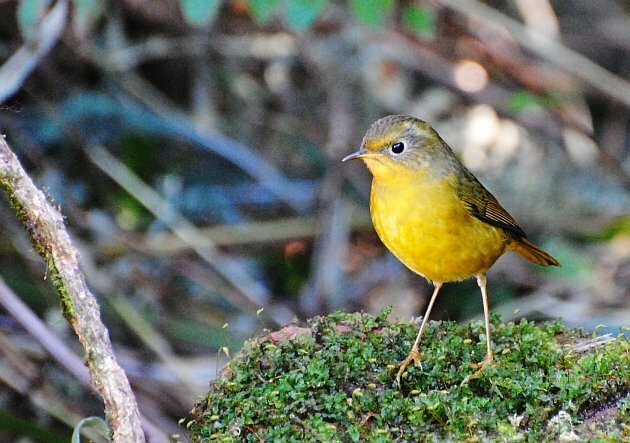 A cooperative female Golden Bush-Robin, usually seen in the Himalayan foothills or southern China’s highlands. However, the biggest reason Doi Lang has rapidly become one of Thailand’s great birding destinations is the long list of vagrants that show up on the mountain every year, depending on how harsh the winter is in China. During strong cold snaps in southern China, many species move south to mountains in northern Thailand such as Doi Lang. In December 2013, we had a large assortment of vagrants to chase that year up on the mountain, providing us with two days of great birding. They all came so easily, and it was just so much fun (not every birding trip needs to be an adventurous slog!). Near the beginning of the road, a gorgeous male Ultramarine Flycatcher with its sharp blue and white coloration dazzled us along with a large group of photographers. 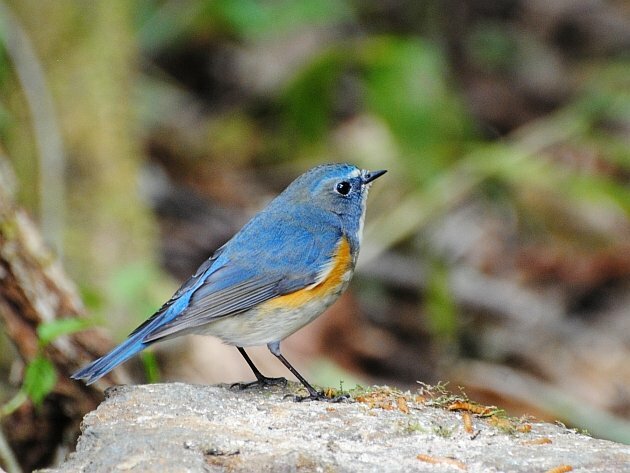 Further up the road, we bumped into a female Sapphire Flycatcher in a mixed feeding flock. At the Burmese border overlook, we scoured a flock of the relatively common Gould’s Sunbird in search of a vagrant Fire-tailed Sunbird. Just behind us, a Golden Bush-Robin was regularly coming to one feeding station while both Red-flanked and Himalayan Bluetail visited another. It was rarity overload! 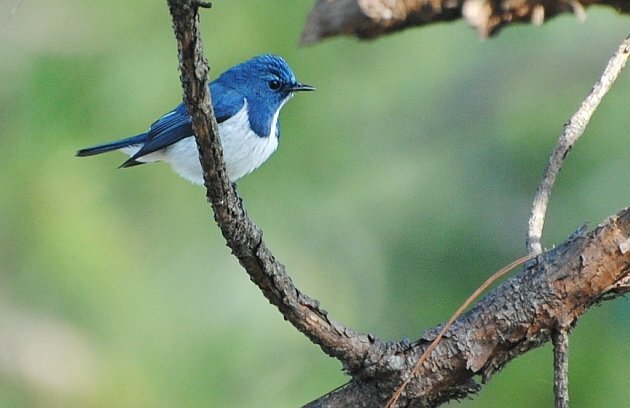 How can you not fall in love with flycatchers when they look like this Ultramarine? (note: Old World Flycatchers, part of the Muscicapidae, are not closely related to the Tyrant Flycatchers of the Americas, the Tyrannidae). Andy and I spent two days birding Doi Lang (and eating the best food we had in all of Thailand at a small restaurant in Tha Ton at the foot of the mountain), and we could have easily added an extra day at this site. There are large sections of relatively pristine forest with open trails that were mostly quiet on our visit but could potentially produce feeding flocks with desirable species like Himalayan Cutia. There is also the added excitement of finding your own vagrant at any point along this road. Indeed, several more rarities showed up after we left. As we left Doi Lang one last time, we found a responsive pair of Spot-breasted Parrotbill, an amazing bird not too distantly related to the Wrentit and my last bird in 2013. Parrotbills such as this Spot-breasted have loads of character. I imagined them to be very different before I saw my first species! 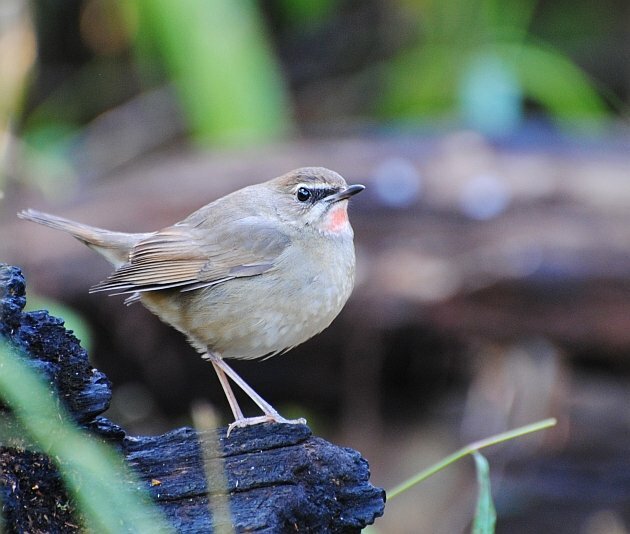 Siberian Rubythroat was part of the regular cast of winter characters in the thick secondary growth at Doi Lang. Just so people know, the government has been closing the checkpoint at the top of the mountain recently, so it is more difficult to bird both the wet and the dry (west and east) sides of the mountain at the same time. To get to the west side from Fang now requires circling around the mountain.